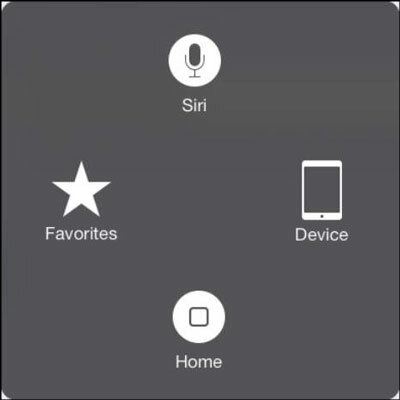 The AssistiveTouch Control panel on the iPad is an accessibility feature that helps those who have challenges working with buttons to provide input to iPad using the touchscreen. Tap Settings on the Home screen, and then tap General and Accessibility. In the Accessibility pane, scroll down and tap AssistiveTouch. In the pane that appears, tap the On/Off button for AssistiveTouch to turn it on (see the figure). A gray square (called the AssistiveTouch Control panel) then appears on the right side of the pane. This square now appears in the same location in whatever apps you display on your iPad. Tap the AssistiveTouch Control panel to display options, as shown in this figure. Tap Favorites or Device on the panel to see additional choices, tap Siri to activate the personal assistant feature, or tap Home to go directly to the Home screen. Once you’ve chosen an option, tapping the Back arrow takes you back to the main panel. The table shows the major options available in the AssistiveTouch Control panel and their purpose. and make requests of your iPad. the presets in this option. Home Sends you to the Home screen. In addition to using Siri, don’t forget about using the Dictation key on the onscreen keyboard to speak text entries and basic keyboard commands.